Due to a mistranslation of the Secret History of the Wold Newton Universe, ( I really must concentrate on that Eridanean!) 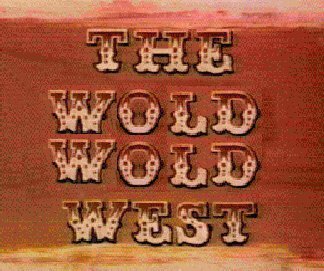 I made the statement in the previous version of the Wold Wold West that Daniel Reid was James West. I must now correct that statement. Daniel Reid was not the James West whose exploits were detailed in the Wild Wild West series. However he did use the name for a short time having been manipulated in a plot to discredit and possibly kill the real James West. There was an uncanny resemblance between the two men but that is to be expected since they were cousins. James West, and the man with the cover identity of Artemus Gordonfought villains armed with anachronistic technologies supplied by Eridanean, Capellean and perhaps other Alien sources for two years when it became apparent that they villains were not only stepping up their attacks but that they had become aware of the investigation duo of West and Gordon. The varied career of James West is too lengthy to go into detail in this essay but a Mark Ellis and Win Eckert have provided a great chronology of his adventures exists here. I agree with the chronology of the adventures but I respectfully differ from them when it comes to the genealogies of the characters. To confuse the enemy they created another investigative team with the Cover identities of West and Gordon. For this team they chose an African-American soldier and an experienced agent, one who was not only a master of disguise but also a gifted inventor. The implementation of the second James West identity was also partially political in origin. In order to placate Radical Republicans who desired the swift and immediate integration of the African-American into government service. However as time wore on the Radicals fell from leadership and from favor. Racism reared its ugly head and segregation and separatism became not only the law of the nation but the norm of society. Therefore, to save itself from embarrassment and to escape from notoriety, the exploits of James Douglas Henry were "whitewashed" and attributed to James West. Who was this second James West? And is there any relationship between he and the first one? Yes, they were unknowingly related through the Silver family. Oddly enough, they were also distantly related to their mortal enemies, the Loveless brothers. Amelia Cross accompanied her brother and John Silver on a trip to New York state. While touring New York City, Amelia Cross met Jason West a wealthy merchant. Jason West was the grandson of Jasper Western and Mabel Dunham whose courtship was detailed in The Pathfinder by James Fenimore Cooper. Jason's father had for reasons unknown dropped the ern section to his name. Pleased with the match, Paul Cross arranged for his sister to be married. Amelia and Jason had a son named John born in 1842 and another one named James born in 1843. John West became a renown cowboy. He was also an officer during the Civil War. After a small skirmish with some border ruffians, John West and his troops came across a small homestead that the ruffians had burned to the ground. Hidden near the homestead in a small rockpile was a wailing infant. Rather than leave the child to the tender mercies of an orphanage, John West decided to adopt him, named him Young Wild West. Young Wild West's adventures were chronicled in the series of dime novels named Wild West Weekly which ran from 1902-1927. Young Wild West struck it rich while still in his teens by taking gold from the Black Hills. He used the money to buy the Champion Ranch. Young Wild West's ranch foreman was a tall, black-haired man named Cheyenne Charlie. Although I cannot be certain I think this may be the named Cheyenne Bodie of the Cheyenne Television series. Young Wild West married a girl named Arietta Murdock. They had one son named Billy, who became the main character of the Wild West Weekly pulp magazine of 1927. Billy eventually married Stella Fosdick. It is unknown as this time if they had children. John's brother James of course became renown as the Secret Service agent James West whose adventures are chronicled elsewhere. After a long service in the Secret Service, James West retired to Mexico apparently to raise his families. According the the film Wild Wild West Revisited he had several children among which was a boy. The boy became a private investigator, as did his daughter, Honey West, the gadget using sixties private eye.